When I reviewed the original radio-controlled Halo Warthog back in 2009, I thought that was it, and there would be no more. It was cool for younger kids, and looked pretty decent, but it was a little on the small side at about 8 inches in length. In 2010, they surprised me with this brand new release, which is almost 14" long. 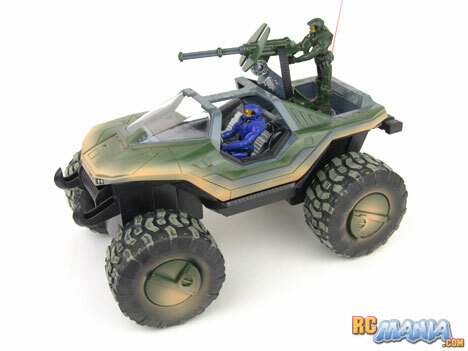 Like the original, this RC Warthog includes two action figures (a generic Mark VI dude and a Master Chief on the gun). The scale of the figures with this one is way off (too small), and the detail and finish on them is pretty cheap. The way Master Chief is shaped & jointed, he doesn't even fit right in either the driver or passenger seats on the 'Hog. On the vehicle, the big tires are way out of proportion too, and give the whole thing an excessively toyish look. Speaking of the tires, they are still a pretty hard rubber, especially stiff & plastic-like on the sides, though a little softer in the middle. On the bright side, this bigger Warthog does come with all batteries you need to run, including a 7.2V NiMH rechargable pack for the vehicle (with a wall charger). I first tried to test the RC Warthog in my house, but it was actually too fast for indoor use! Outside on a flat open surface I could really open it up and tap into its potential. This thing has some pretty serious speed for a toy-grade RC -- so much so that with the hard tires and minimal suspension, things started to rattle off of it. It was no surprise that the Master Chief figure fell off from his perch on the turret. What was most unexpected & unwelcome, though, was that the battery door suddenly fell off. The battery itself came out and tripped the whole vehicle, flipping it over. The battery door has no latch on it, just a Phillips head screw to hold it in, and that screw is too small and stripped out quickly from the force of the battery bouncing around. I had to replace this with a 3mm (about 1/8") screw. I actually tried to pull a less-important screw out of the underside of the body to use for this at first, but I found that those were all the same size, and surprisingly about a third of them were missing. After the fix and enjoying the speed on flat ground for a bit, I took the Warthog onto some gravel, and then out to a more bumpy dirt field. The oversized tires might not look exactly right on the Warthog, but they allow the vehicle to drive over rough terrain pretty well. Between this and the amount of power that the motor & battery together provide, I was able to do some serious off-roading without getting stuck very often. It's slower on dirt than it is on the street, but it's still quick enough to be fun. However, I did start to notice another problem. Often when I would go over a bump, or would come to a stop and then accelerate again, there would be a loud clicking or racheting sound from the vehicle. From experience I could recognize this as the sound of small plastic gears slipping -- a very ominous sign. The vehicle kept running just fine, but I fear that eventually some of the teeth on the gears will snap off, ruining them. The new 2010 edition RC Halo Warthog has very respectable performance. Its speed is surprisingly good, and it goes over gravel and bumpy dirt surfaces really well. I appreciate the inclusion of the battery & charger, though I wish the whole package was about $10 cheaper for what's included (2011 update -- it's now $10 cheaper!). The vehicle has a lot of quirks. Aside from the mediocre action figures and the odd proportions, the missing screws, stripped battery door screw, and slipping gear all paint a picture of low quality and leave me wondering what will go wrong next, and especially when the transmission will give out. I was not able to perform long-term testing before this review has to be published, so it's possible that I've already experienced the worst of the worst, and that no further problems will pop up. With my brief personal experience, though, I would have to say to prospective buyers, "Proceed with caution." If you get one from Toys R Us, pay the few extra dollars for the buyer protection plan. Anywhere else, make sure there's a linient return policy and make sure the Warthog gets used plenty soon after it's bought, so if anything does go wrong you'll at least be able to take it back.